All of them – the staff of the reserve, people from the villages around, hunters, farmers, owners of B&B’s, wildlife experts and many volunteers – can hardly hide their excitement. Somewhere in the distance a truck engine makes a rumbling noise, breaking the silence of the Rhodope Mountains. The truck with European bison. The months of preparation are finally over. And now is the day. The Bison Day! The first day of the first reintroduction of European bison into the Rhodope mountains, to an area which is also one of the first members in the ”European Rewilding Europe”. We follow the advice from Yvonne Kemp, our bison colleague,to keep enough distance from the truck and not disturb the animals. Bit by bit, step by step we all started getting closer to the truck, towards the cameraman of bTV (Bulgarian TV) who had the most favoured view. The platform with the opened truck doors looks more like a theatre stage, we all want to be close and not miss even a single moment of the performance. But nothing. Hardly any moves for more than 30 minutes we all feel as long hours. Finally some movement started and it all went very well. First the four bison girls vanished from the truck and into the free roaming in their new home. Spiro, the bull, was the last in row. He took his first steps onto the green meadow and … then he went several times back into the truck. Thereafter, Spiro started to show his macho behaviour by confronting a shrub, head on. It did not take long however, for him to hook up with his new family members. The rest of the day the animals were monitored with a lot of interest, to see how they discovered their new surroundings. They looked fine, walking around as a group of nosy youngsters. The long day ended with a good glass of Grasovka vodka and many cheers to the first bison in the Rhodopes, from all the people involved: Yvonne, the New Thracian Gold team of Frank, Hristo, Stefan and Dessy, the guys from the reserve and the locals who helped with the fencing of the bisons’ temporary home. In Europe, the bison went extinct in the wild in 1927, mainly due to severe hunting pressure and loss of habitat over centuries. The same happened in Bulgaria but much earlier, already during the Middle Ages. 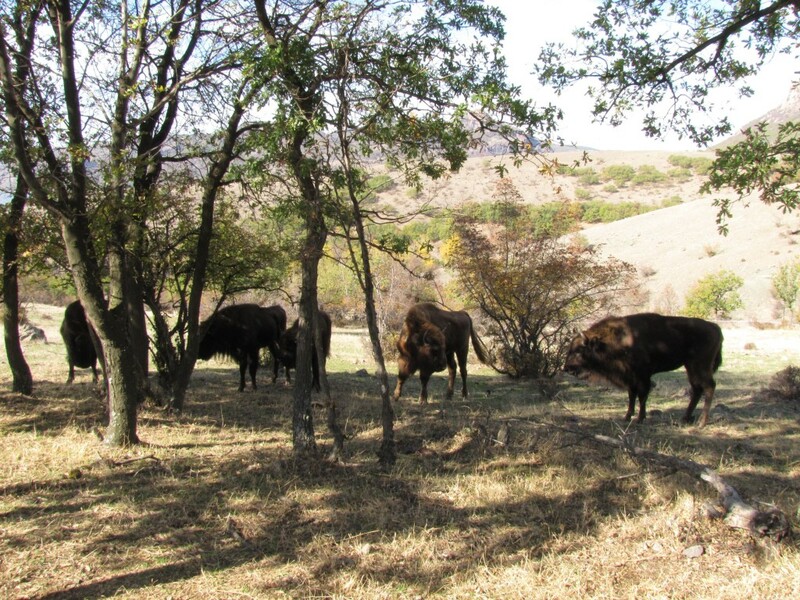 In the 1960s a small herd of bison was reintroduced to a hunting reserve in Northern Bulgaria. The bison in Studen Kladenets Reserve today have a very different mission: to re-wild nature in this part of Europe and to keep its unique magnificent mosaic landscape, so rich in biodiversity. And one more reason: Studen Kladenets wants to further develop the wildlife watching tourism. The bison are an addition to the fallow deer, red deer and roe deer, wild boar, wolf, fox and vultures (Egyptian, griffon, black). After a successful acclimatization to the Rhodopean conditions the bison will be released completely into the wild. The team is convinced that the European bison will be one of the great ecosystem attractions of the Studen Kladenets Reserve and that it might become a new wildlife symbol for the Eastern Rhodopes, next to the wild horses that were successfully reintroduced into the same region back in 2011. In no time the Bulgarian bison became very popular TV stars, through the TV documentary “Going back to the future”. Local people and tourists started coming to Studen Kladenets just to see the bison. The animals were constantly monitored and seemed to do just fine. But then came the unexpected: three of the bison got sick. The bison experts worked day and night trying to help, doing the impossible. The two youngest, however, died. Detailed examinations have been done, but the team still does not have strong evidence of the exact causes of death. Hristo, Stefan and Dessy were every day with the sick Egbertine taking care of her as if she was their own beloved child. They were not alone with this battle: many local people and volunteers came to give them a hand, the staff of the Reserve also helped out. The other two bison did very well, and showed their social herd behaviour to stay in the neighbourhood of their sick group member. “She is walking again, she is even jumping”, Dessy called me early one morning in January with this great news. There were no happier people in this world than the the Bulgarian bison team! It is known from several successful projects elsewhere in Europe that reintroductions of this highly endangered wild species are not always without setbacks. With the dedicated people in the Eastern Rhodopes and the support from the European bison friends network, problems are faced and the experiences gained will be shared to enlarge the knowledge about the bison and its comeback to Southern Europe. Some lessons are very bitter, but the feeling is positive, we are still learning on the job.